This Adorable Little Boy Will Surely Make You Laugh After Watching Him Break this Piece of Wood! They said that everyone's talent can notice during our youngest age. That is why parents tend to enroll their children as early as possible. One more thing, children always find their happiness during their discovering stages. The time where they can play and learn new things at the same time. As we all know, most parents are very supportive at all times. In any ways that they could give they are doing their best for their children. School presentation was one of the most interesting moment for every child. Aside from their preparation, giving a stunning show is the one that they are aiming. This video was filmed by one proud parent. His little boy attended a summer of Taekwondo, very cute thing on his action was when he was trying to kick and break the board. Even everybody was laughing at he him, he still continue way to divide it into half. 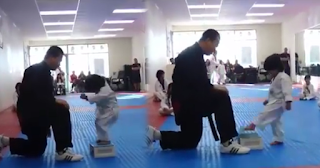 Watch how adorable this cute little kid with his own taekwondo moves.